Warning – this book ‘contains TOP SECRET ideas that are NONE of a cat’s business’. 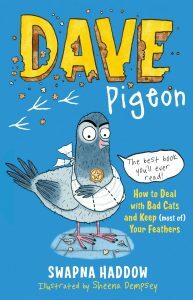 Swapna Haddow has just released the third in her Dave Pigeon series. As all 3 books have received rave reviews, we thought we’d start at the beginning. Say hello to book number one: Dave Pigeon – How to Deal With Bad Cats and Keep (most of) Your Feathers. After bonding big time during a failed croissant heist, Skipper and the injured Dave are taken home by a kindly Human Lady. Their eyes are opened up to an amazing world of biscuity/breadcrummy heaven (the kitchen)… which they unfortunately can only gaze at through the windows of the shed that has become their home during Dave’s convalescence. They are understandably desperate to move in to the house, but Mean Cat, Human Lady’s feline companion, has other ideas. The birds thus decide that the cat has to go and so a number of cunning plans are concocted – some clever, some not-so-clever – to remove the moggy from its residence. Unfortunately, though, Dave and his trusty sidekick fail to consider the unintended consequences of their success. Always remember… be careful what you wish for, as your plans may come home to roost (see what I did there?). I have to say that this is one of the funniest children’s books I have ever read – if Dave and Skipper don’t make you laugh, then quite frankly you haven’t got a pulse. I love everything about it. It’s highly illustrated with brilliant black and white graphics by Sheena Dempsey, and the story is effectively told by the 2 hilarious pigeons who could give the best comedy duos a run for their money. There are so many layers of ‘funnyness’ in this book: the ‘speech bubble’ banter between the 2 birds; the superbly witty writing throughout; Dave’s constantly revised cunning plans (or are they Skipper’s? ); and the chapter titles, my favourite being ‘The Chapter that I, Dave Pigeon, Have Decided to Call Chapter Eight’. On the back-cover blurb, there is a quote: ‘making the world a better place for pigeons everywhere!’ In my opinion, it should be revised to say ‘making the world a better place for humans everywhere!’. *I include publisher age ranges as a guide only.